The recipe can be used if you have guests over for dinner. Mushrooms enhance any preparation, adding a special flavor to dishes. I used light cream for this dish. It’s necessary to use mushrooms that are small, white, and well cleaned. 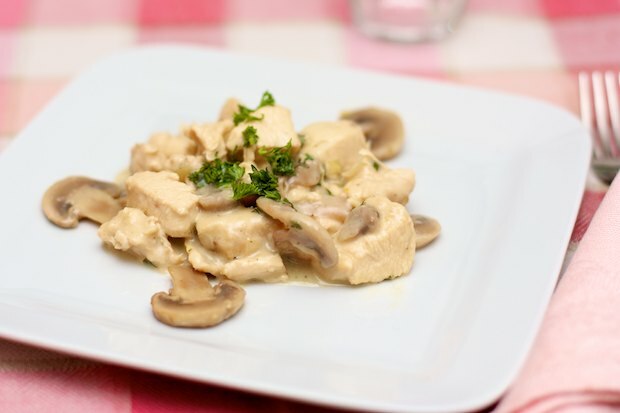 If you see champignon mushrooms that have an opaque yellowish tint or dirty caps they are most likely old and therefore not suitable for this dish. Cut the meat into small pieces like you would make for stew. On a large plate, roll the chicken pieces in flour. Clean the mushrooms by cutting off the part of the stem that has pieces of dirt, slice them, then add the mushrooms to a bowl containing water and the juice of half a lemon (this helps keep them white). Add olive oil, a clove of garlic, and thinly sliced shallots to a pan. Sauté the shallots then add the mushrooms along with the liquid they were resting in. Cook at high heat, stirring often, to dry out the mushrooms. This should take about 10 minutes. Season with salt and pepper. Remove the mushrooms from the pan with a slotted spoon and set them aside on a plate. In the remaining sauce, add the chicken pieces and turn up the burner. Stir quickly. After 3 minutes, pour a cup of white wine and allow it to evaporate. Season with salt and pepper. Stir quickly, and after about 10 minutes, add the mushrooms back in. Cook for another 5 minutes, then add the finely chopped parsley and finally the cream. Cook 2 minutes then serve. Posted in Meat and tagged with Bocconcini di Pollo con Funghi, Chicken Morsels with Mushrooms. RSS 2.0 feed.